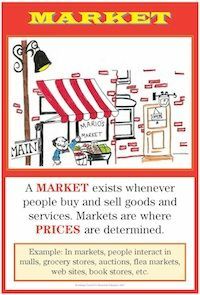 In a market economy, prices are determined by the interaction of consumers and producers in markets. There are three basic types of markets: Goods and Services, Productive Resources, Financial Capital. The prices that are determined in these markets serve as a guide to economic activity. For example, if the relative price of a certain good is high, this means that there is a potential of greater profits. Entrepreneurs have an incentive to divert resources to the production of that good. Eventually, as supplies of the good increase, the price falls, signaling that productive resources should be diverted to the production of other goods or services. Discuss this statement: "In a market you always have buyers and sellers." Have students give examples of middlemen (individuals and firms who help bring buyers and sellers together in a market). Identify "sights and symbols" of market activity. Examples include McDonald's golden arches, Nike "swoosh," and advertising jingles. On the board, list different examples of people buying and selling goods and services. Circle situations where buyers and sellers don't necessarily meet face to face (stock market, Internet, phone, etc.). Cut out advertisements from newspapers representing a variety of stores in your community. Make a chart comparing the prices of goods and services from different stores. Discuss why these prices vary. Give examples of the market for human resources (labor). Discuss the importance of having a resume. Have students create their own resumes, or have students cut out classified ads in the Help Wanted section. Analyze the education and skill requirements of different jobs. Discuss the stock market. Explain the purpose of a stock market. Have students look up companies and prices on the stock page of their newspapers or on the Internet. Upper elementary students may want to participate in a stock market simulation, such as the Stock Market Game (See www.stockmarketgame.org). It is important to note that in a market economy this "undirected" economic activity, based on changing prices, produces a high level of efficiency. This is very different from centrally planned economies, where the attempts of government bureaucracies to guide economic activity typically result in much inefficiency. In a market economy, many individuals and firms play the role of middlemen. A middleman, such as a car dealer or stockbroker, helps to bring buyer and seller together. Although there is a fee for service, the middleman greatly reduces the time and effort it takes for buyers and sellers to get together to make a transaction.